I’ve been lucky to live in the same place for my whole life. No matter where I actually live I’ll always be able to call Buffalo my home. This is not the case for Pico Iyer, the author of The Global Soul: Jet Lag, Shopping Malls, and the Search for Home. He is the son of East Indian parents who raised him in England. He feels he is a member of neither culture. After growing up in England, living in California for some years, then moving to rural Japan he is at a loss when someone asks him where he is from. This brings to mind a famous quote about traveling by a Roman Philosopher “Everywhere is nowhere. When a person spends all his time in foreign travel, he ends by having many acquaintances, but no friends.” The same can be said of home and I found this to be quite true when I traveled through Bern, Rome, Innsbruck, Munich, and Amsterdam in just one and a half weeks. I’ll never make that mistake again. It was a great experience but it felt so rushed. My experiences abroad have made me want to travel more and I plan to do so in the future but I will try not to make the same mistakes Pico has (not that those mistakes were necessarily his fault). What I want to do is to go to German for a full year on my own, learn the language and culture and I guess try to make a home away from home. I can’t pinpoint exactly why I want to go so bad, maybe it has something to do with the feeling of being in a completely foreign place. When I was in France I was with a large group of people so I didn’t have to adapt to the culture nearly as much as I would have if I was alone. The thought of being alone scared me a little bit and I questioned if I could actually make it. Would I be able to learn the language, make new friends, and understand the culture, could I eventually become a part of it? Leaving France, these questions were left unanswered and for some reason I can't let it lie, I know I have to see if I have what it takes because if I am able to do all those things I know I will be a better person as a result. Pico faced these same difficulties but it seems like he didn’t fully commit to any one culture or that culture just wouldn’t let him. I wonder if I be able to succeed where Pico failed, but it almost seems not fair to compare the two of us. If I do end up failing utterly I can always return to my home in Buffalo and at least I won’t have to live with the regret of not having tried. Pico just concedes defeat and wearily goes on to try again, I wish him the best of luck on his journey and hope I can make my own. Tis', a book about and written by Frank McCourt, is about Frank's immigration from Ireland to the United States in the early 1950's. Upon reading the book I found we had a similar sense of humor, somewhat sarcastic and the ability to find a little bit of humor in everything. This is a must when adjusting to a new culture because one is bound to cross the line and make mistakes eventually. Having the ability to laugh these learning experiences off is a lifesaver. A big difference between us though is that when Frank sailed into New York Harbor he had no one waiting for him. There wasn’t a smiling face waiting to take him to a dorm and a warm meal as there was for me. He did however befriend a pastor who helped him find a job and an apartment and it didn’t take him long to find some fellow Irishmen and find a good old Irish Pub to grab a Pint in. Frank also had the advantage of knowing the language when arriving in America as opposed to the few French phrases I knew and proceeded to butcher on arrival. In Ireland Frank was used to living in a small close-knit community where most people knew each other by name. When he arrived in New York City however, the shear size of it caught him off guard and the sense of community was just not there. The switch for me was almost opposite of Frank’s. My University has a population of over 32,000 students and it’s in a semi-rural area where houses sit on their own one acre lots and neighbors don’t even know each other. When I got to UTT it had a much smaller size of 2,000 students and the town had a much greater sense of community. "It's hard to think I would have missed the same tea and bread every day, the collapsed bed swarming with fleas, a lavatory shared by all the families of the lane. No, I wouldn't have missed that but I would have missed the way it was with my mother and brothers, the talk around the table and the nights around the fire when we saw worlds in the flames, little caves and volcanoes and all kinds of shapes and images." After a few years Frank was able to get into NYU and he earned his teaching degree. He went on to become an experienced teacher and later a Pulitzer Prize winning author. I hope to have as much success as him. in discussion General Threads / Book #2 : Comparisons » A day in the country! does not actually apply to my experiences of the French countryside however intriguing they may be. This story proves true to many attitudes of Parisians who currently live in Paris. They see a great difference between "city life"
come. I know that that was true for me. My name is Reneé Benoit and I'm traveling to the United States to study at the University of Buffalo. When I arrived I found it difficult to get used to the language and had to ask most people to talk slowly so I could understand them. I had taken two years of English classes before my trip but I've learned there are some things that they forgot to teach us. Many phrases I heard made no sense to me but after a couple of months I was able to hold a steady conversation and was able to get by in my classes. The University gave me a room on North Campus in a place called Elicott Complex. It looks like a lot of Lego's pieced together. My roommate Adam turned out to be a very nice guy and we became friends quick. He introduced me to his group of friends and helped me adjust to living in America and helped me a lot with my English. They took me to a place called Clifton Hills in Canada where they liked to go because they could drink legally there. This was quite funny to me as the drinking age in France was 18. At UB there are over 30,000 students, that's over ten times the students that even attend my Universitat back home. With this many people I've found a couple clubs that interest me and I've made many friends in these clubs. I joined a 'soccer' intramural team with some American kids and we actually ended up winning the League, we got free T-shirts. Everything seemed to be much faster paced than in France. Being late was very frowned upon and everyone seemed to be in a hurry and some of the classes had over 150 people in them. I was used to a much smaller class size and when I asked questions it seemed like everyone in the room turned around and stared at me. Getting around in Buffalo was hard because I didn't have a car. The University is actually outside the city of Buffalo and there isn't really any Public Transportation to speak of. To get anywhere you have to drive or fly and I learned that the rail network is used mostly for moving goods. When it came time to return to France I was sad to say goodbye to all the friends I had made. The trip has had a big impact on me and I think in the future I will look for more opportunities to travel the world and maybe get a job that would let me travel, learning English will most likely help me in this area. The goal to send 1 million students abroad within ten years will not be easy to achieve but with the right leadership it can happen. Globalization is occurring faster and faster every year and studying abroad helps you learn to communicate in that global economy. The Senator Paul Simon Study Abroad Act (SPSSA) is a wonderful idea and I whole-heatedly support it. From my experiences my summer in France helped make me the person I am today. While it may be a bit much to say I was a different person when I got back, I know I had a different outlook on the world. The French culture definitely made me appreciate the lighter side of life with their two hour lunch breaks and 35-hour work weeks.Unfortunately my summer was rare, there are not a lot of people, students in particular, that get to spend two months in a different country. The Senator Paul Simon Study Abroad Act is the first step towards making a summer like mine a little more accessible. When I got back to the states it seemed like every other conversation I had was about some story over in France. I became a walking advertisement for the UB Study Abroad program and pitched the idea of Study Abroad to anyone who was willing to talk about it. Most of my friends listened with jealousy, but when I asked them why they didn’t go or if they were planning on doing it in the future they gave me excuses like it cost too much money or it wouldn’t fit in with their major. This is where the SPSSA could help. As I am preparing to go Abroad again I am facing a number of obstacles that will take a lot of time to overcome. I have to match up my courses from the University of Darmstadt in Germany to ones available here at UB. I'm sure the UB Study Abroad office will help guide me along the way but I will have to make most of the arrangments on my own. Hopefully if SPSSA can help students with this process and maybe even pitch in financially. Another of SPSSA’s goals is to encourage more students to travel to “non-traditional” destinations, specifically the developing world (i.e. Africa, Central America). With the fall of the U.S. dollar and the rise of the Euro these places are becoming more attractive. The first goals of this new organization should be to build relationships with Governments and Universities in underdeveloped countries. The experience would be beneficial to both the host country and the student. Growing up in America and never leaving the country (except for Canada), my view and thoughts of the world outside my borders was limited to what I had read and what I had heard from other people. My decision to Study Abroad came easily as several members of my family had studied abroad. I decided to follow suit and luckily my University offered a Study Abroad trip for freshman only to France. Before I left I didn't know a word of French and whenever I told people I was thinking of going to France they would ask "why, don't they all hate Americans". Some people were like that, they held preconceived stereotypes of a people they had never met and a culture that they had never experienced for themselves. Then there were people who told me about their experiences and adventures around the world and it was these people who had the biggest influence on my decision. I decided that I couldn't depend on other people, books, and television to tell me what the world was like, I'd have to go and see it for myself. So before leaving I was still unsure of my expectations, would I just be another annoying tourist or would I be welcomed with warmth and hospitality? The answer to that turned out to be a little bit of both. It mostly depended on the person in question. Over time I found that if I was respectful and polite people would usually be the same in return. It's hard to find words to describe my first few days in France, the best comparison that I can make is like being a kid all over again. Everything was brand new, and I mean everything. People dressed differently, the bread tasted different, the milk wasn't refrigerated, the store had three whole isles for beer and wine, I used public transportation, the coffee was crazy strong and came in little cups with cubes of sugar, and the biggest difference of all, everyone spoke French. I started to make friends with the people in my group and even started meeting some Frenchies. They were all students of the Universitat we were attending and they had a lot of fun showing us all the cool places in town and teaching us all the French cuss words, rest assured we repaid the favor. While we did do a lot of work during the week, we made up for it on the weekends by traveling all over France. We went rock climbing and bungee jumping in Milleau and spent two amazing weekends in Paris. We all took turns doing fake Scottish and Irish accents as we partied with 10,000 French kids on the lawn in front of the Eifel Tower, walked the Catacombs hundreds of feet below the streets of Paris, toured the Louvre and Versailles, sampled the great wines and beers of France and had the time of our lives. These are memories that will stay with me for the rest of my life and I wouldn't trade them for the world and in 2009 I'll be going back, this time to Germany for a year, and 2009 can't come fast enough. in discussion General Threads / Book #2 : Comparisons » Angelina Jolie "Notes from My Travels"
I read “Notes from My Travels” by Angelina Jolie which is a diary she kept during her first visits to Africa, Cambodia, Pakistan and Ecuador. Her perspective upon entering this new land was that of an under- informed American just wanting to know what was really going on. She continuously talks about how she has the choice to go there and learn. She then contrasts that with the fact that the people who are living these lives have no choice; this is what they were given and this is what they must live with. I entered Mexico hearing so many horror stories about the poverty and the crime but I was surprised at what I learned. I had expected to see the sadness that I assumed comes with the suffering, but it was no so apparent. Jolie made a very good point about these places in that there, “it just seems important to laugh”. These people who have been through life’s most terrifying moments still find a way to smile and a way to find the good, no matter how deep they have to dig. When she first landed she described the experience of trying to communicate with the UNHCR representative as being hard at first but she “realized quickly that smiles and gestures were all you really need sometimes.” I think that I relate to this in terms of my travels because there were just times when I could not understand what people were saying and if I just smiled, they usually got the point and found some other way to communicate with me. One of her moments of self-realization was on a small plane right with a group of Sierra Leoneans. She said that everyone was very friendly and talkative except for the two people in front of her and she had been thinking to herself that they were not very nice people. Half way through the trip they opened up to her and told her that they had just been held captive by rebel troops for six days and their silence was due to the horror they felt at the airport. She then thought “I was ashamed to realize that I had judged them; I should feel lucky to be in their company”. I cannot tell you how many times I judged the people there in my first weeks, in my attempts to rationalize certain racial stereotypes placed on the Mexicans. As time went on however, I found that the stereo typical “lazy Mexican” was usually a man who woke up before dawn and has put in a good 7 hours of hard physical labor before taking his afternoon “siesta” so he can have the energy to return to work later. It is far easier to pass judgment than to try to understand the things we look down upon and I think that traveling is the best way to learn this. My final and favorite statement made my Angelina Jolie relates to the current political problem of securing American borders. Angelia very wisely summarized it by saying, “Our country and other countries will continue to have refugees crossing our borders unless we help strengthen the countries from which they come.” What many Americans fail to understand is the disparity of so many of these “illegal immigrants” that are fleeing from the political and financial situation imposed on Mexicans by the governmental trade agreements. I think that I relate so well to her perspective because I remember being at that point in my life and feeling these things and just wishing there was someway to write it and get it out to the world; or at least those who could care. re-runs of Dawson’s Creek. Everything we Americans take for granted, Italians see it as being especially extraordinary. 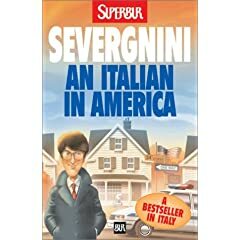 Un italiano in America is a tale of Beppe Severgnini and his wife, as they stay one year in Georgetown, Washington DC. It is a light hearted tale of their adventures learning about the American customs and way of life, including renting a house, buying furniture, the extreme temperature changes, saving money by clipping coupons, and even the all American garage sale. unimportant factors, which are events that when recalled to memory create a feeling of melancholy, for you know those are the small events you will not experience until you return to that country. One of the most entertaining chapters of this book is at the beginning when they first come to Georgetown. When I moved to Italy for my second study abroad, I was worried about what I would need to bring to my new house. I was arriving there with two suitcases, the essential contents of my entire life , but if I were to find a house…where would I sleep?! Fortunately in Italy it is normal to find apartments which already have furniture; beds, dressers, stoves, refrigerators, and I was lucky enough to even find one with a washer! So you can imagine the shock that Severgnini and his wife got when looking through the ads trying to find a small house with all the basic amenities. Needless to say they caught on to the fact that finding a place with all the basics was going to be impossible. So they found a small quaint house large enough for what they needed, and when on to go look for furniture. As I was reading, I could tell that they were buying into the phrase ‘everything is bigger in America’, when they bought a king size bed. In Italy the normal sized bed for the average couple is our full sized mattress. They also end up buying two La-Z-Boy’s following suite in true American fashion. I think both authors of both books I read this semester had a great opportunity to see and record their experiences first hand. Each of them shared it in different ways, Severgnini with a more comical twist, giving more detail and personal opinion. Maggio’s experiences were easier to relate to since what was new to her, was also, at one point new to me. I like that she was able to get an inside view into the small and almost forgotten mountain villages in Sicily. Through both books I am able to relate to their separate experiences. Going to a new country and experiencing culture shock is much more fun than going through reverse culture shock (getting use to your home country after a long time away). Coming back to your home country and realizing that there were things about the place you just visited that you appreciate more than the customs of your own home is sometimes discouraging. I look at it as a positive drive to keep traveling, see new lands, and learn about new people and cultures. in discussion General Threads / 500 Word Narrative : Pretend to visit the USA » Les Etats Unis! Si j’étais une native de France, venir aux Etats Unis serait très intéressant. Je sais qu’il y a des surprises quand j’ai voyagé en France. Je suis sur que c’est le même chose en reverse. Même si avant arriver aux Etats-Unis, les Européens ont leurs propres idées de notre mode de vie, gouvernement, et morales. La première chose sensible est que tout ce qui est si grande !! Les maisons, les voitures, les portions de nourriture à Mc Do, même les gens sont toutes énormes. En France, nous avons les choses simples et petites. Nos vêtements sont plus chers que les Etats-Unis, cependant, nous achetons moins que les américains. Je suis excitée à faire du shopping ici. Un autre chose que me fait rendre étonné est la glace dans les sodas des restaurants. En France, nous prenons nos boissons sans glace. C’est bizarre ! En école, quand j’ai appris anglais, j’étais pas mal ou si j’ai pensé. Quand je suis arrivée aux Etats-Unis, je n’ai pas pu comprendre rien ! Les américains parlent trop vite ! Je ne sais pas l’argot et c’est difficile pour moi à s’exprimer. Un exemple de cela est quand j’ai voulu aller pour une ‘coupe de cheveux.’ Je n’ai appris jamais comment donner les instructions pour une bonne coupe de cheveux. Enfin, J’ai décidé accepter une coupe très basique. Ne personne m’a dit que j’ai eu savoir les mots spécifique pour une coupe de cheveux !! L’université est différente aussi. En France, nous pouvons être en retard aux cours, mais pas à l’université de Buffalo. Les classes sont très structurelles et j’avais peur quand je dois parler. C’est justement une autre différence entre les Etats-Unis et France. Les Etats-Unis sont un terrain très différent qu’Europe. J’adore France mais j’aime bien les Etats-Unis au même temps. Je crois que le plus grande différence est le mode de vie. En le façon que, ici, le mode de vie est très vite. Les « drive-thru’s » et les cafés `a emporter sont bizarre à moi. Avant venant ici, J’ai pensé que je n’aimais pas les américains. Je sais que je n’aime pas leur président, George Bush. Et Je ne lui aime pas encore, ha ! J’ai pensé que les américains me détester. En réalité, ils étaient très gentils. Ils m’ont aidé quand j’étais perdue à NYC et je l’ai apprécié beaucoup. Je souhaite que J’aie eu 21 ans ! En France, Je peux boire les alcools mais pas ici parce que je suis trop jeune, dommage ! Donc, je suis heureuse être en New York mais France me manque beaucoup. After hearing about the Senator Paul Simon Foundation Study Abroad Act I am amazed that something like this is not already in place. I feel that too few Americans are given the chance to go abroad and open there eyes to the world outside our borders. have to go abroad. It is an experience unlike any other. There is just one problem; it is too uncommon in the U.S. People are afraid to commit to something they know so little about. There are not enough students who have already gone abroad to tell them about their travels and encourage them to have their own. When I signed up to go abroad I was lucky enough to know someone who went on the same trip the previous year. He told me all about what he did and got me so interested that there was no way I was not going. I committed my self to the program and no one was going to stop me. After spending time at the University in France I found out how common it was for students to go abroad. For many of them it was mandatory if they wanted to get a degree. The program I participated in was strictly set up for engineering students and had been running for close to five years. Everything was already planned and all I had to do was submit an application. The courses were pre-selected and pre-approved. This year I have decided I want to go abroad again. This time for a full academic year. Planning and preparation are a lot harder this time. I have yet to meet a single person who has studied at the University I plan to attend. I have no idea what it is going to be like over there (although that is part of the excitement). No body here seems ready to help me with my plans. I have spent months running around on campus talking with several people who are supposed to tell me what I need to do, yet none of them seem to be able to give me a straight answer. I thought they would know what courses I could and could not take, and whether or not they will count for the courses I need to take here at U.B. It apparently takes months to get approval, and I am forced to go to each individual professor and ask if I can take his course at another University. I feel that a lot of these problems are created because our system is not used to having people go abroad (especially the engineering department). If it were more common for student to go abroad it would become easier and soon many students would be studying in a foreign country. The senator Paul Simon Foundation Study Abroad Act is a great idea and can make studying abroad common in higher education in America. I recently had the chance to interview an international student here at the University of Buffalo. I met Martin Zink through mutual friends. Martin is from Wiesbaden in Germany. He has lived here in the United states for close to three years now. He still maintains his German citizenship even though his parents now live in the U.S. and are American citizens. Martin has a lot to say about life here in America. He has come to enjoy living here. Last year was his first year in college and he seems to enjoy attending the University of Buffalo. During his first year he joined a Fraternity and is now an active member of Sigma Tau Gamma. Martin tells me he has never regretted joining the fraternity and loves being a member of and American society. Martin also has some negative things to say about America. He strongly disagrees with President Bush’s policies and is actively against the war in Iraq. Although he can not vote he has told he wants Barack Obama to be the next President. Martin is an international political science major, so he follows politics closely. I asked him if he is as interested in the politics of his native country, Germany. He said he is very interested because he returns there often. He has a sister who lives there and he stays there during the summer while working at in internship back in his home town of Wiesbaden. This lead me to my next question which was whether he plans to stay and work in the U.S. or if he would rather live and work in Germany. Martin says he loves and is proud of his German heritage. He told me the reason he kept his German citizenship was so that after he graduates he can move to Germany and get a job there. He says that Germany is where he belongs and where he wants to be. My name is Pierre Jean. I am a student from France visiting The U.S. for the first time. I will be staying with some American friends that I know who attend the University at Buffalo, in New York. I am excited to experience life in America as opposed to life in France. I am sleeping in my friends room at the dormitories on campus. They are a lot different than those in France. The complex is huge and there are so many students living here. I can not believe how small the rooms are, at my school there is room for everyone. However it is very enjoyable, I am meeting so many new people and everyone is willing to become my friend because I am foreign. In France the community I live in is very small and I know everyone there, but here I feel as though I can spend a week being introduced to new people and still not meet everyone. I can not believe that the University can support such a large student body. In France there would not even be enough food for everyone to eat. Everyone here is in such a hurry. In between classes I see them rushing around in the corridors and outside on the walkways (though that may because this campus is so huge!). I am used to enjoying the day while I slowly make way from one class to another. The American students do not even seem to have the time to stop and talk with a friend they meet along the way, they just say hello and continue on their way. The classes are very different also. Everyone seems to arrive at exactly the same time. The classes begin right on time and those who are late appear to be embarrassed at not being there right on time. It is almost as if they would be penalized for being tardy. The food here is not as good as back home. Most of what I have eaten has been served was made on campus by my friends or the University (though the food on my campus in not very good either). I have tried Buffalo wings for the first time. I was told that I should try spicy first, but that was awful. I think some of my American friends were playing a joke on me. I switched to medium and found them to be very enjoyable. I am not yet twenty-one years of age which means I can not drink legally here in America. This is a silly law, though it does not seem to be enforced. It seems to more of a joke between college students. Many of the other aspects of life here are the same as in France. It seems that humans all over the world are still humans. I have enjoyed my stay here in America and I have learned much. I can not wait to visit again, though I do want to see what else the world has to offer. When I signed up to go abroad in the summer of 2007 I expected a lot of things, almost none of which turned out to be true. My experience abroad differed in many ways from what I was told and what I thought it would be like. Although I can tell you what it was like for me, no one can tell you what it will be like for you. I studied at the University of Troyes in France. Fifteen students including me were there for five weeks during which time we took two courses and received six credits. I thought it was going to be impossible to cram a semesters worth of two courses into five weeks, but it turned to not only be possible but better than taking them at UB. One of the courses was EAS 207. This is an engineering course that requires a lot of work. However, with only fifteen students in the room the professor had a much easier time explaining the complex concepts. This made it easier for us to learn and I am proud to say that I got an A in the course. Even now as I am taking advanced Engineering courses I feel more confident because I have a better understanding of the material thanks to a solid foundation in EAS 207 (a lot of my coursework this semester is based on the principles learned in that subject). When I left for France I expected to have a good time. I was wrong. I had an amazing time. Everything we did was an adventure. Just learning how the bus system worked so we could get around town was fun. Finding new restaurants with foreign foods was eventful. Even just walking into a pub to relax with a pint after we finished our homework was something I was never able to do in the U.S. I thought I might never get used to eating their food on an everyday basis. I can now say I sorely miss fresh baked French bread, duck, jambon (ham), and there was even an authentic Turkish Kebob restaurant. I had a kebob almost everyday I spent in Troyes. The nightlife wasn’t what I expected either. Troyes is a small city, but it has several great places to go to at night. There was a night club, and a lot of different bars to hang out at. I expected most of the French to immediately dislike us because we were Americans. This was not true. After spending a couple of night at a bar called Le Furious we got to know the bartender, and became friends with the owner (he was always giving out free drinks and even gave us tee-shirts with the bar’s logo on them). We also got to know a few of the French students who showed us around the city and talked with us about what it was like to be a French student as opposed to an American student. I had a great time abroad, and I tell everyone who will listen that they should go abroad too. Just don’t expect any of your expectations to be true. in discussion General Threads / Book #2 : Comparisons » A German in Texas? Yee haw!...? Can you think of two people more different than a German and a Texan? From the stereotypical punctual, organized, straight-postured European to the slow-paced, Republican, sweet southern American, one can well imagine a serious culture shock in either case. For Elise Wupperman, who came from Düsseldorf, Germany to Texas in 1850, it was a whole different world. Her private journal is available on-line, translated by her daughter. Her whole family moved with her to Texas, where her life on a farm began. As seen in many travel documents, or accounts of immigration/study abroad, the linguistics barrier seems to be the most difficult. This is perhaps because it is the most obvious deficit—it is more recognizable when one can not communicate than when one is not keenly aware of cultural practices. Her personal diary recounts her experience as a German immigrant to Texas. Certain entries of her journal recount linguistic experiences, some quotidian occurrences. One day she says “Mein lieber Otto schoß ein Eichhörnchen, eine Entre und ein Rebhuhn” which translates to: „My dear Otto shot a squirrel, a duck and a partridge today.” Such simple events ruled her life in Texas, as in 1850 it was not the developed state it is today. She speaks of the many activities she enjoys, like horseback riding, which she didn’t learn until her arrival in America. In getting to know her neighbors, Elise spoke of the great cultural dishes they shared, such as “Apfelpai”: apple pie. She also discusses how she has to laugh when her parents attempt to speak English, and fail, though heartwarmingly to pronounce words correctly. Though we can draw some linguistic parallels if we compare Elise’s experience with one of a German student or family coming to American today, it would be rather different. My host sister Adina, and my friend Sarah (both German) upon their arrival in America remarked on how good the food was, and how big EVERYTHING here is. The “walk-ability” of the streets in America is in many cities and most suburbs, absent, so we rely more on our cars. Typically, Germans coming to America today gain weight because of our eating habits—by this I mean eating a large dinner and a lite lunch. (However, many Americans who go to Germany gain weight also due to the increased bread, butter and cheese intake). The experience of an immigrant in the 1800’s differs vastly from that of modern German students arriving in the United States. In reference to the first two works I looked at, Mark Twain’s Die Schreckliche Deutsche Sprache and the film Auberge Espagnole, Elise Wupperman’s journal differs greatly. Elise stays mostly within her family and German Community, communicating from time to time with her few Anglophone neighbors. Twain and the characters in Auberge Espagnol, on the other hand, explore the new place they are in and truly immerse themselves in the language and the culture. Elise’s experience is, however, much less recent, and took place during mass immigration to America. While they struggled to make a life in a new world, Twain and the students in the film spend their time learning the culture. They did not need to make a new life from the bottom up as Elise did, instead they had a goal: to attend a University, or to learn the language. All of the people and/or characters I analyzed, however, established themselves in the country they were visiting, and really, what else matters? 25 Août: Je suis arrivé à Buffalo aujourd’hui. J’ai pris un taxi à l’université ; c’était la moyenne la plus facile, particulièrement après avoir essayé de déchiffre les horaires des bus. L’université est géant, beaucoup plus grande que la mienne en France. Beaucoup d’étudiants habitent directement au campus, moi aussi. C’est très facile ; il n’y a pas de chercher partout, et bien qu’il soit un peu cher, ça vaut le coup. 28 Août : J’ai eu mes premières cours, et en comparaison, ils me semblent si faciles. Il y a presque deux cent gens dans mon cours de physique ; le prof lit d’une présentation de Powerpoint qui est pris directement du livre. J’ai appris la plupart du matériel au lycée. Ça va être trop facile. D’ailleurs, je suis avec l’équipe de rugby après avoir assisté un entrainement. Il y a tant d’équipes et des clubs à l’université, c’est vraiment cool. Les américains n’ont pas si extrême comme spectateurs de sports, mais très actives en jouant. 9 Septembre : Malgré mes pensés, l’université n’est pas la plus facile ici. Les profs veulent beaucoup plus travail de moi qu’en France, et bien que le matériel soit vieux pour moi, c’est que mon première année. Je trouve la manière de vivre un peu bouleversant, c’est plus rapide. Les gens ne se parlent pas autour le campus, tout le monde a des portables et des mp3s. La bouffe est plutôt cher et différente, mais j’ai découvrit quelque chose qui rend super l’Amérique : le « steak hoagie ». 29 Octobre : Je suis encore en train de m’habituer à la façon dont les américains parlent. La somme d’argot utilisée est incroyable. Aussi, les anglophones ont tant mots spécifiques qui dépend de la situation. Par exemple, les deux phrases (très collégial) « to get some beer » et « to get some beers » veulent dire quelque chose différent. J’ai aussi trouvé l’opposé des mots spécifiques, il y a des mots un peu vulgaires qui peuvent appliquer à presque toute situations. C’est une langue très versatile. 15 Novembre : J’ai noté qu’à mon université, les gens sont un peu confiné au campus. Autour le campus, il y a des bois et des magasins, mais il est presque impossible à jouir la région sans voiture, particulièrement puisque il fait plus en plus froid. Les distances sont trop grandes pour aller à pied ; l’Amérique était bâtie pour la voiture. 3 Décembre : Il fait trop froid à Buffalo, mais le neige est incroyable ; je n’ai jamais vu tant de neige. Ce qui est extraordinaire est que les gens qui habitent ici continuent à vivre comme le neige n’existe pas. Il n’est pas si étonnant pour eux…mais moi, je l’adore. Tout va bien, je me suis finalement habitué à ce pays. Mes cours sont encore durs, mais je comprends mieux maintenant qu’avant. Quant à la langue, j’apprends encore, chaque jour, des changements (et l’absence) des règles grammaticales en parlant. After reading the general description of the Senator Paul Simon Foundation Study Abroad Act, I have to admit that I’m very impressed that our congress is taking steps to simplify American students to study throughout the world. In my opinion, knowledge of our world is imperative to students now more than ever, and as our generation begins to work it’s way into the leadership positions of this country, experience abroad will be a defining characteristic of a well-qualified individual. As a country, throughout the last sixty years we have been struggling to undergo the great change from being an isolationist nation to the most influential country in the world. It’s a task that’s not easy, as one can still see today the effects of our ignorance of the world outside our borders. The proposed Study Abroad Act promises a step in the right direction to form a generation that is informed and involved in the world, allowing a more peaceful future. When I was studying in Europe, most of the foreign students that I knew were studying through the Erasmus program, a program that is aimed at promoting academic mobility of students and teachers throughout the European Union and other European countries. For many students that I met, it’s an academic requirement to spend up to a year in a foreign country. The Erasmus program has become a sort of cultural phenomenon in Europe, as many students are living in a foreign country for the first time and forging bonds with other students from around the world. The proposed Study Abroad Act seems to me a step towards creating a program similar to the Erasmus program, though on a worldwide scale. Hopefully, the Act will facilitate studying around the world, especially financially. In the United States, the price of even a state school is outrageous compared to universities around the world, though the level of quality is high. With the price of tuition added to the cost of the study abroad programs, it’s very difficult for a student to fund a program, and although there are scholarships available, they’re limited. Another problem I found, at least with my program, was that students who were not some sort of language, literature, or history major posed a problem when it came to finding classes and transferring credit. When I went to France through SUNY Cortland, I was assumed to be taking all French language and literature courses with maybe some random electives. After finding out I was a physics major, it was a struggle to get me enrolled in regular physics and math classes, which I ended up not receiving credit for. Though it is an excellent experience, for many majors apart from languages and literature, a stay abroad at the moment is academically useless unless one manages to find an appropriate program, which in my case were few and far between in the country I chose. Another step this Act must take is to be able to diversify the disciplines one is able to study while abroad. I believe that this act is an excellent opportunity for our country to retake a respectful position in the world today. The knowledge one gains abroad of other cultures, languages, and manners of living is easily applied to life at home, and as our generation matures into the leaders of this country, hopefully this knowledge will seep into our country’s policies abroad, allowing us to make better decisions in the global community. Mon séjour en France était un peu d’une révélation dans plusieurs sens. J’ai eu l’opportunité d’apprendre une manière de vivre qui est différente de la mienne, et bien qu’il ne soit pas une manière exceptionnellement exotique, avec l’expérience j’avais la chance de me familiariser mieux avec le monde. Mes expectations en arrivant avaient été remodelées par plusieurs cours de la langue et aussi un séjour court que j’avais pris en France il y avait trois ans. Mon première fois que j’étais en France, cependant, j’avais habité avec un ami et sa famille ; j’avais donc dû m’habitué de vivre moi-même. J’ai pensé, en arrivant, que mon niveau de français suffirait, puisque j’avais étudié la langue depuis cinq ou six ans. Malheureusement, j’ai trouvé un monde sans « classroom french », où il fallait déchiffrer un mélange de l’argot et des raccourcis linguistiques. Ce serait naïf à ne pas anticiper cela si l’on fait attention à la façon dont on parle l’anglais, où on mélange régulièrement les règles fondamentales de la grammaire pour faciliter la communication. Une partie de la vie là-bas dont j’ai connu avant de partir était la façon plus tranquille avec laquelle la vie progresse. J’avais encore dû m’habituer, comme la vie aux Etats-Unis peut plus souvent être trépidante, de mon expérience au moins. Les magasins ferment tôt, tout le monde prennent un long pause pendant le jour pour le déjeuner, les gens marchent plus et prennent plus de temps avec les repas. Bien qu’il pût très (très) irritant de temps en temps, c’était très facile à m’habituer à cet aspect (mais c’est beaucoup plus dur à revenir à la vie rapide). Il y avait beaucoup de choses que j’avais su existé en France, mais pendant mon séjour j’ai appris l’entendu. Chaque étudiant qui fera les études en France apprendra tout le vocabulaire qui relie à un aspect caractéristique des français : la grève. J’ai eu l’opportunité à être directement touché par plusieurs grèves pendant une période de quatre mois. Même mon université était bloquée, quelques facultés pendant plusieurs semaines. Les trains étaient empêchés de rouler pendant plusieurs weekends, qui n’ont pas permis personne de voyager loin de la ville. Enfin, j’ai fait mes études dans un pays qui n’est pas en général très exotique quant à la manière de vivre. Bien sûr, j’avais dû m’habituer aux choses qui étaient relativement différentes, mais il y avait rien très extrême. J’ai appris la manière de vivre sans problème, même intégrant ces manières dans ma vie. A cause de mon séjour, je trouve que je suis mieux capable de m’adapter à situations étrangères. in discussion General Threads / 500 Word Response : Study Abroad Act » Paul Simon has the right idea!! do students from other countries. The idea in America is that we are the power country, we are important and everybody must adjust to us. and cross-cultural skills they will need to succeed in today's global age." Simon does not just see studying abroad as just giving students a 'great experience,' he is looking ahead to our future to see how this will greatly aid us. international trade alone would more than compensate for the cost." Of course I am in huge support for this Act. I first travelled abroad in 2004, only for a week, and felt it was the best thing Ive ever done. along with a foreign nation. These experiences will definitely help you in the future, whether you work abroad or you stay in the United States. idea in starting this Act to encourage study abroad. I recommend it to anyone because it most certainly changed my life for the better. in discussion General Threads / 500 Word Response : Study Abroad Act » Get 'Em All to go Abroad! The Paul Simon Study Abroad Foundation Act is a long time coming. Such an innovation has been needed for years, especially in a time of globalization in which world peace is a question without a known answer. As a patron of Study Abroad Programs, I think the government should embrace this Act. If a proposal of this magnitude comes to fruition, I believe it will not only create generations of more respectful, tolerant individuals, but also increase the more important facets of an education: maturity, understanding and worldview. You have no idea how many people I’ve spoken to about my experiences abroad who have reported wishing that they could’ve gone somewhere exotic. My mother, for example, has never even been to Europe. So many of my fellow students say they wish they could’ve studied abroad, but their major programs didn’t allow for a semester out of UB. Others didn’t have enough money to pay the high costs of American Study Abroad programs (which is climbing more and more each year). Many said that even the Summer Semester programs that tend to last about 6-8 weeks were too expensive. It’s true. Many Business majors or Engineering majors must miss out on the opportunity to Study Abroad because their four year programs are set in stone. If students are allotted not only time in their hectic University curricula, but in addition more government funding in order to spend time abroad, it will not be money wasted. Instead it will be money spent wisely to increase the maturity level expand the Weltanschauung of the American people. Furthermore, it could improve the view of Americans abroad, which at the moment, isn’t one of great revere. An American who speaks another language? What?! Or two languages!? Unheard of, you Americans don’t care about learning a foreign language! Many of us do, but just don’t seem to have a clear chance at getting away for long enough to become proficient. Opening up Study Abroad to more diverse locations, including developing countries, I believe has positive and negative effects. There are still many countries that are not safe, due to internal conflict. I read every day in the New York Times about the unrest in Kenya. I always wonder if one day Americans will be able to travel in the Middle East without the stigma of being American, or the fear that there are people who dislike our government enough to harm us as individuals. I went to Europe with the prior notion that I would be disliked due to my nationality, or due to the Bush administration, or the War in Iraq and it wasn’t true. There was a true separation in judgment of the US Government vis a vis the American people. Study Abroad isn’t the Peace Corps. Parents want their children to go somewhere safe, where Americans are accepted. I know from personal experience that just the words “Ecuador” or “China” can strike fear into parents’ hearts. Perhaps if this bill is passed, and an increasing number of Study Abroad programs are developed in areas that are not frequented by American students (namely Europe and Latin America) the sentiment of fear and the unknown will be eradicated and more people will be willing to send their children away to these places. One last thing I would like to say about this bill is its eagerness to send all students. This means, all races, from all financial backgrounds, from all sorts of family situations, and from all sorts of locations. This sounds quite promising to me—in fact, this may be the best part of the bill. Not only financial aid can send someone abroad. Once he or she is in a foreign land, money is necessary to pay for food, transportation and school supplies. Money is an intimidating factor in study abroad—especially in European countries like France where the cost of living is reasonably higher than in the United States. This bill would work wonders for students dependent on financial aid and scholarship just to attend school at all. Overall, this bill has wonderful motives. I clearly support it. Interview with Pierre Gatreau, an international student from Nantes, France. What was the process like, getting enrolled and such at UB? Did you have trouble transferring your credits here? This spring was your first semester; was it difficult to find housing? The process of getting enrolled at UB was long and difficult. First I had to apply. To do so I had to get all my transcripts from high school to college translated into English. Then after several months of back and forth email about what level I was going to start at, they accepted me. Then I had to apply to be a student with which was expensive and took a long time. I chose to live on campus because the housing process wasn’t hard and was very similar to the regular student process. When I arrived here, I had more problems to worry about. I had to fight for them to accept my transfer credit. After a couple of days they finally gave them to me and I had two days left to register for my classes before they were going to start. What were your first impressions of the campus? What were some of your impressions compared to your university in France? Did you have any trouble adjusting to the lifestyle here, especially the dorm living and making friends? What’re some tips and tricks you’ve learned living on campus? Can you give me a comparison of student life here and student life in France? The student life here revolves a lot more around campus. There are clubs and sports activities available after class which creates a school spirit and a campus life. In France, the campus is almost exclusively centered on the academic part. There are less clubs or extracurricular activities offered. In France, we don’t choose our schedule; it is assigned to us, which is good and bad. We don’t have to worry about registering for classes but it makes the system less flexible. Though you do speak English well, do you still have trouble following in class sometimes? Are the professors willing to help you when you do have a language problem? What surprised you the most about studying/living at UB? The biggest surprise was the amount of homework. In France, we study a lot on our own and we are asked to turn in very few homework. Here, I have a lot of problems, papers or reports to turn in every week. This is the main difference. What aspects of studying here have you found most difficult to adapt to? I didn’t really have any problem to adapt to studying here but as I said before the homework load was a big change for me. I’m still adapting to that. Lastly, do you have any advice for students who plan to study abroad in the future, either in France or elsewhere? I think that the most important thing is to be open-minded. I know that a lot of things may seem to be very weird or you may think that they are wrong, but in reality they are just different. The more you will know the culture the better you will understand why such things are different. And they won’t seem to be so stupid after all.